Where can i buy this console table? Unfortunately I am unsure of this.It was already installed prior to we started working at the property. These tiles were from Mandarin Stone. Love this colour paint what is it called please?! The paint colour is slipper satin from F&B. wicker flower baskets - Hi, where can I get these baskets please? Andrea Von added this to This Week on Houzz: Guess Which Affordable Accessory Makes You Smile? 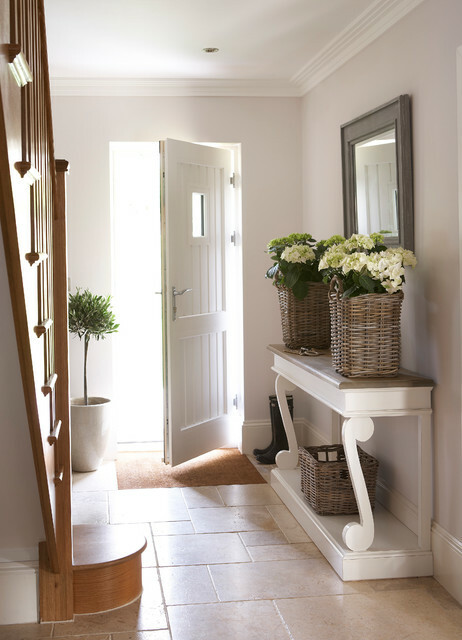 ‘A house without flowers, to me, is just a house, not a home.’ Jo DPCreate a homely feelFlowers are a great way to create a feeling of home: this hallway seems much more lived-in thanks to the baskets of hydrangeas. Try potted blooms for ongoing colour.Give your home’s exterior a boost with one of these window box ideasTELL US…We’d love to see how you bring flowers into your home. Share your photos in the Comments below. Add a natural touchFresh or potted flowers, or even a vase of simple green foliage from the garden, will work wonders to inject a bit of life into your hallway. Consider placing a scent diffuser or candle in your hall, too, to ensure your guests are welcomed with a sweet-smelling entryway, rather than a pile of smelly shoes! Spruce up your hallwayGet ready to welcome guests into your home by revitalising the first space they see as they step through the front door – your hallway.Bring in a dash of summery cheer with a new runner and hang up a series of hooks to whisk bags and coats off the floor or stairs. A clean and clutter-free entrance will give guests a sense of what to expect in the rest of the home. The hallway and stairsYour hall is possibly the most important space to keep clear. It’s the first room anyone stepping through the front door – including you – sees, and gives an overall impression of your home. If a cluttered hallway greets you after a long day at work, then a cluttered mind will be the result.Hallways – and not just the entrance – are the arteries of your home. If they’re blocked, it affects the flow of energy and, on a practical level, how easily you can physically manoeuvre around your own house. Quick clear-up tipsIf you must store items in your hallway, make sure you put some restrictions in place. At the entrance, examine the types of items that keep landing in this spot and make sure any organising solutions you put in place are only for the things you absolutely need to home here. Also, try to contain storage in one area rather than having it scattered the full length of the hall. If there must be clutter, at least keep the mess to one section of the space. Exaggerate proportionsCreate a smart first impression in a country-style hallway by going overboard with super-sized floral displays. Big blooms, such as lavender or hydrangeas, in matching baskets or pots, positioned at either end of the table and framing a large mirror, will be ideal. Choose convincing fake flowers if you’re likely to let the real things droop. Hide clutter (post, keys, dogs’ leads) in a matching basket underneath. Show it the doorMany of us hang onto perfectly good stuff that we never use, as we think, “It’ll come in handy one day.” The trouble is, these things tend to languish for years until they’re no longer any use to anyone. Instead, donate items that are in good condition sooner rather than later. Think positively about who might be able to use that item later that week, if only you’d allow it to go.You’ll probably have loads of stuff to donate and throw away, so remember to schedule time to take your donations to the local charity shop, or your rubbish to the household recycling centre. You can also book a bulky items collection with your local council, or schedule a charity collection if you have large items to donate.